Poker players are often their own worst enemies. It’s one thing to have a bad session because you played against a few strong players who outmaneuvered you at critical times. It’s another thing to have a bad session because you didn’t play to the best of your abilities and knowledge. The more you are able to play the best that you know how, the better your results will be. One way not to play your best is to go on tilt. That’s not really what I’m talking about here—at least I’m not talking about hard tilt where you can easily feel that your emotions are getting the better of you. Another way not to play your best is to zone out, and that’s also not really what I’m talking about. Obviously if you choose to watch a movie on your tablet during the game, you are unlikely to play your very best. But presumably you knew that before you queued up Beverly Hills Chihuahua 7, and you decided to watch the movie anyway. But there are lots of little mistakes that we make that are neither caused by tilt nor by total inattention. I call these unforced errors—mistakes that our opponents aren’t causing in us by playing tough, but that we make nonetheless. Here are a few unforced errors to avoid. Unforced Error No. 1 — The Marginal Preflop Call Against A Raise. This one is fairly obvious, but I see it so often that it deserves to come first. Almost everyone plays too many hands. That in itself is an unforced error — but one that more often than not goes unpunished because everyone else is also playing too many hands. But one situation where people commit unforced errors preflop is when someone raises after they’ve made a too-loose preflop play. For example, say it’s a $1-$2 game. A player limps in, and you are three off the button and limp with A-9 offsuit. Then the next player raises to $12. The big blind calls, the limper folds, and it’s back to you. It’s often tempting to call the raise because you close the action, the pot is laying some odds, and there’s some cognitive dissonance to limping in and then folding to a single preflop raise. But really, unless you have a strong opinion about your ability to outplay the preflop raiser, calling here is going to be an unforced error. You’re likely better off just writing off the $2 and folding. This is a fold I see players make inconsistently. They treat it like it’s a last-minute judgment call, or a play they should mix up by calling sometimes and folding sometimes. But really I think most of the calls count as unforced errors. While you don’t want your play to be predictable, you do want it to be logically consistent. If it’s really worth a fold, then you should just fold and move on. Don’t get stuck in. Unforced Error No. 2 — The Pot-Committed River Call. The concept of being “pot-committed” in a no-limit hold’em pot is widely misunderstood. 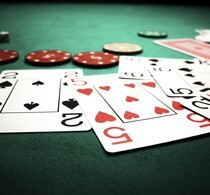 It’s common for players to consider themselves pot-committed to a pot once they put a certain amount of their stack in. For instance, if they’ve started a hand with $300 and they put $180 in the pot by the end of the turn, many players would simply consider themselves pot-committed and commit the remaining $120 on the river. That is, they would commit the remaining money as long as they have a made hand. On a busted draw, they will easily fold and save the $120. The unforced error here is that if it’s “obviously” best to fold and save the $120 if a draw busts, it must also sometimes be best to fold and save the $120 with a made hand that can almost never win.
. Everyone checks and you bet $30. One player calls.
. You check, and your opponent bets $130 and all-in. Any decision you make automatically, without real regard to the particulars of the situation, is a candidate to be an unforced error. Take an extra second and think through your decisions to make sure they really make sense. Unforced Error No. 3 — The River Busted Draw Auto-Muck. This is one I admit to falling prey to more often than I’d like. The situation here is that you have been on a draw throughout the hand, and it bricks on the river. Your opponent bets, and you toss your cards into the muck without a thought. The problem with this play is that bluffing is part of poker, and busted draws are often the hands you bluff with. When you have a busted draw on the river, you usually should at least consider bluffing —and sometimes you should pull the trigger. on the button with a $300 stack. A player limps and another player raises to $10. You call, and the limper calls.
. Your opponent bets $20, and you call.
. Your opponent bets $30, and you call.
. Your opponent bets $50, and you muck your missed flush draw. This is certainly a situation you should at least consider bluff-raising. A wheel and 7-6 got there on the turn. From your opponent’s preflop raise and postflop betting, it’s likely he’s got one pair. Depending on the opponent, your image, the gameflow, and other considerations, a nice big bluff-raise here might win you the pot. It’s certainly not an automatic play—but the unforced error here is just mucking your draw without even considering the bluff. To be a good no-limit player, you have to find bluffs in situations like these sometimes. If you allow your river decisions to become too auto-piloted, then you will make avoidable errors that will ultimately cap your long-term success. None of the ideas in this article are likely new to you. You know of course that you often should fold marginal hands to preflop raises — whether you limped into the pot or not. You know that you shouldn’t call it off on the river with hopeless hands. You know that bluffing on the river is sometimes the right play.